Too often in jazz, we fans agonize over those of our heroes who left us too soon. "What would Bird be playing today?" "What would Miles sound like now?" Well, Sonny Rollins was there in the late '40s and early '50s alongside Bird and Miles, when be-bop and modern jazz were birthed. Helped bring them into the world. Is it his fault he didn't die tragically young? That he's still blowing as hard as ever, still making music that lives and breathes and inspires and elevates? 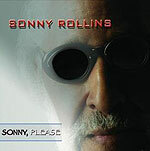 What would Sonny Rollins sound like in 2007? Powerful and muscular, as evidenced on his new studio release. With as gorgeous a tone on saxophone as ever. Improvising solo passages equal parts daring and beauty. Absolutely in command of his music, surrounded by top-tier talent (Steve Jordan, Clifton Anderson, Bobby Broom, Bob Cranshaw, Kimati Dinizulu) of a talent grand enough to both support and push his own playing. What does Sonny Rollins sound like? He sounds like one of the most talented and visionary of jazz players to ever pick up a saxophone, still going strong more than half a century after he first started setting the world on its ear.